Which is the right pumpkin for you? We've go big pumpkins, small pumpkins, bumpy pumpkins, smooth pumpkins... Come pick out a pumpkin in our Pumpkin Patch. Walk through our large patch and pick the pumpkin that is just right for you. Take part of the fall season home with you. Pumpkin pricrs vary from $1 for minis to $65 for Big Max pumpkins. The Pumpkin Patch does close at dark, so come early if you want to go into the patch to pick out your pumpkin yourself. All aboard! Relax and have fun making new fall family traditions as you take a ride out to the Pumpkin Patch and back. Adults and kids alike will have a good time taking in the fresh air and countryside. A wagon ride is included with farm admission at no extra charge. 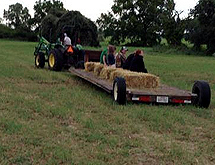 Private hayrides - Private hayrides are available by reservation. Cost is $40 for up to 25 people. 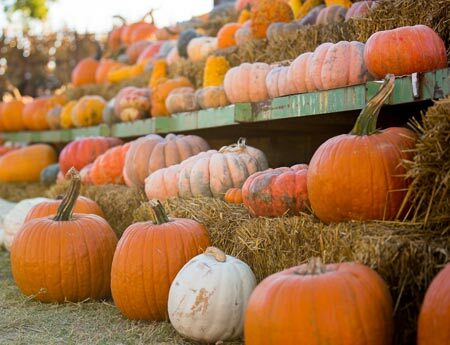 For those that prefer not to venture our to the Pumpkin Patch, choose the perfect pumpkin from our pre-picked selection or browse our selection of other fall décor including gourds, Indian corn, and more. Visitors may purchase pre-picked pumpkins and décor without paying admission to the rest of the farm.